I've gone and done it again - not posting since my last race. I've got to tell you, it's been a very very busy time. No, not that regular busy that all moms face, but actually super stupidly busy. Since we last talked, I found a new job to start at the end of my maternity leave (two weeks from today), which has meant we can finally go ahead with our plans to move home to something bigger to accommodate all members of the family. My almost 1-year old daughter has been sleeping in the living room since pretty much day 1 and we needed a longer term solution than this! Moving home actually means relocating to another city, and we're doing this only 10 days from now. The last month or two has been a major blur, managing the logistics of all this change while still parenting and still trying to take care of myself and keep fit. So that's why I haven't written in a while. But I also explained that all to you as it's relevant to the topic of this post. It is so you can understand further the significance of the race I ran yesterday. 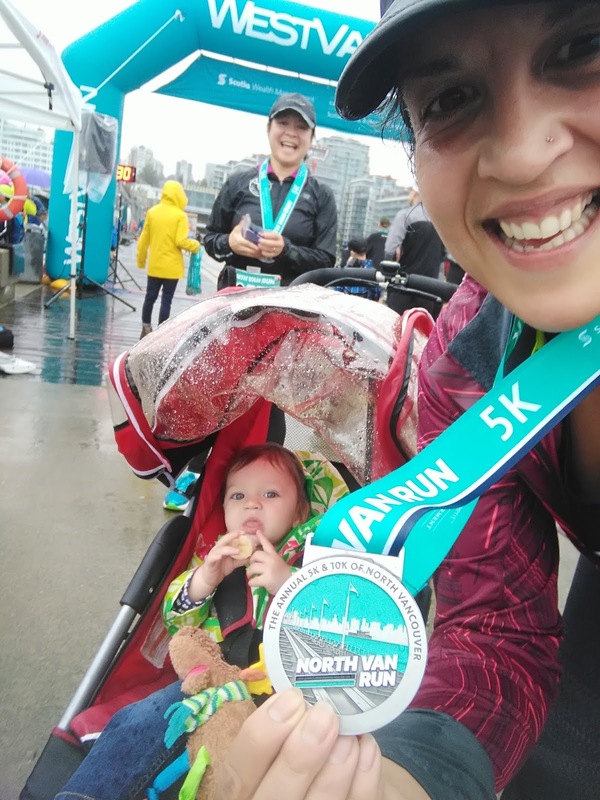 My daughter and I ran the North Van Run 5km yesterday and it was very special, and so much fun! 5km is pretty much the minimum distance I run on any training run, and because I do this about 3x a week pushing a stroller; it's something I am very used to. But no matter what, I will always argue that it's a respectable distance to race, even if the distance itself isn't a big deal. On race day, many run their hearts out to push for the best finish time they can muster. Over 5km, that's often pain, hell, and definite challenge. That hasn't been my approach to recent 5km efforts, as you know. 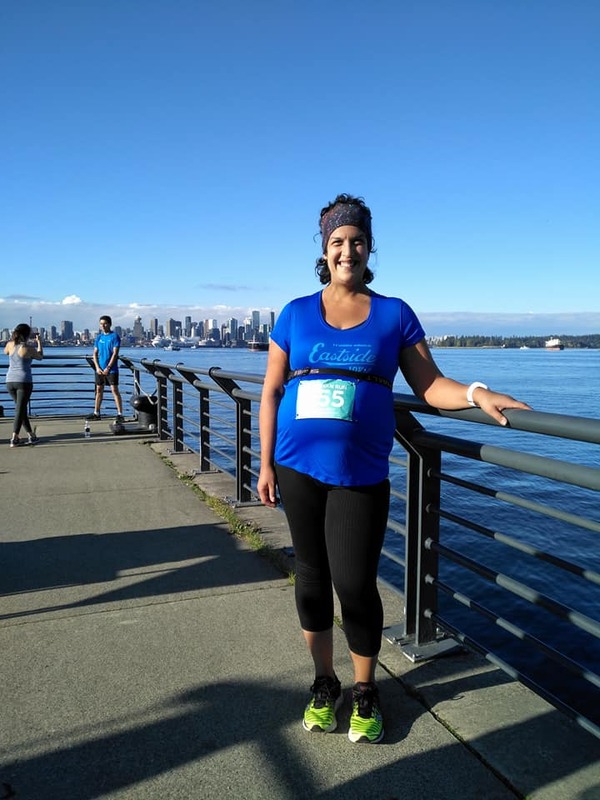 It's instead recently been about maintaining fitness through pregnancy, regaining it again after childbirth, getting past injury, and so on and so forth. All of those things are a big deal to me. Yesterday was all about doing something special. Also a big deal. Mission accomplished. A year ago today was the inaugural North Van Run. Given that I've lived here for close to 10 years and had never raced here, I didn't want to miss out. I was 37 weeks pregnant and little did I know, I only 12 days away from giving birth. It was a great last run before taking a 6 week break from my sport. I felt good on race day, felt proud of my accomplishment, and knew at the end that I was ready to take a break. Like Forrest Gump, I was just ready to stop. Finish line photo from 2017 - you can't really see my belly in its full glory. Fast forward to this year, I wanted to run this same event again, but for the longest time didn't know if I was going to be able to. Our move date was a question that only became clear the last few weeks, and I wanted to not plan my weekends too far ahead in case we needed to take a trip to our new hometown to go house shopping. Even when we put an offer on a house, until subjects were removed and all was finalized, there was a possibility of us needing to work out a plan B. So as soon as it was clear, I registered. 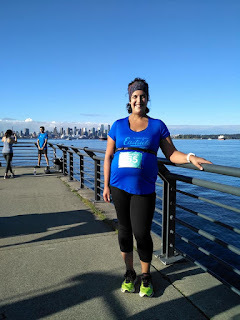 The North Van Run was special to me last year not only because it was my last run before my daughter was born (and me feeling rather badass running 5km so comfortably despite my very very round shape), but also because it's sister race, the West Van Run, was the first race I did after learning I was pregnant. 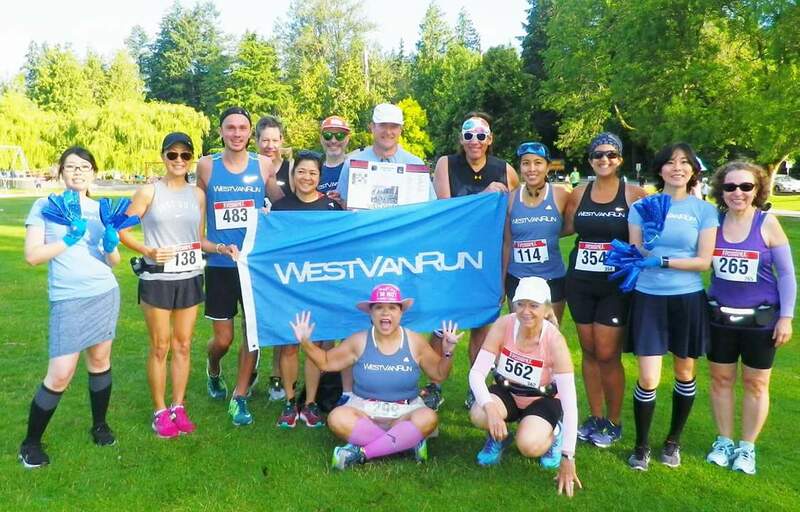 The West Van Run crew are a group of wonderful people that I have gotten to know over the last few years. I didn't run with them frequently, but regardless, I was family to this group. 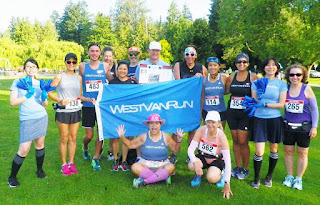 With a few members of the West Van Run crew at the Summerfast 10K in July this past summer. So this year, when I realized that the North Van Run could potentially be my last race while living in Vancouver (where I have lived all 38 years of my life), I had to make it happen. Add to this that if I went with my daughter in the stroller, it would level up the awesome significantly. We had never done a stroller race together, even though we run with the stroller about 3x a week. So to do our first race like that a year after my last race pregnant sounded cool. And if you know me well, you will know that I am a bit of a sentimental sap. My daughter was born in North Vancouver and we are leaving here two days before her 1st birthday. The race was offering a finisher medal this year, which usually isn't a draw for me unless it's a half marathon or more. But with "North Van" emblazoned on the front, I thought this would make a wonderful keepsake for her to hang onto and hopefully inspire her own running or otherwise athletic pursuits as she grows up. 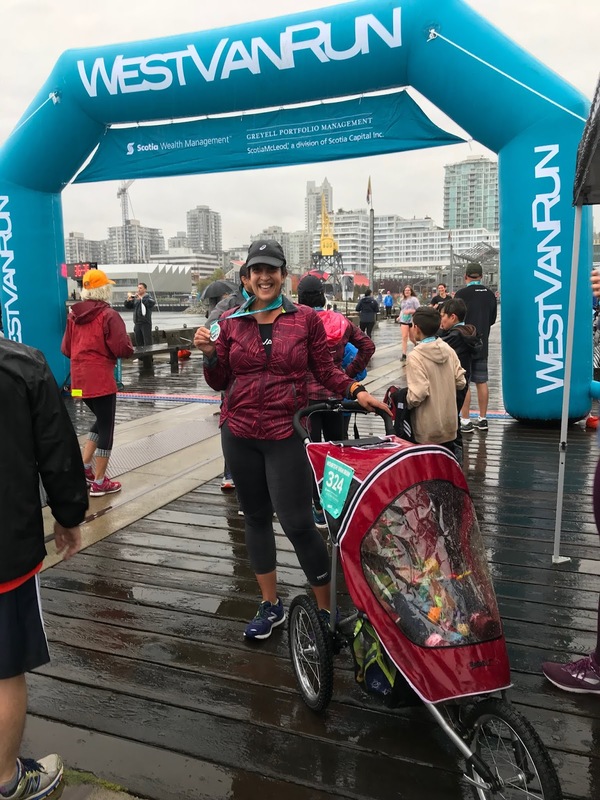 Last year this race offered a stroller division - you actually specified on your registration if you were bringing a stroller. I remember this as I was cheekily suggesting that carrying a full term baby in utero was just as hard as pushing a stroller (or maybe harder!) and that I deserved to be in the stroller division. But this year, this was not the case. The route changed too, so I wasn't sure if I could bring baby or not. I messaged the race director and was told it was fine, so I went ahead and registered and told my husband he didn't need to take the day off so I could race. Baby was coming with me! Saturday night, my daughter fell asleep much later than I would have liked, and I found myself unwilling to wake her up early enough so she could have a full breakfast before the race; she needed her sleep. Her current routine is a bottle upon wake up, and breakfast an hour later. No, this was not happening. It was also super duper rainy outside. When you have a race to do and it's just you, all you have to do is worry about yourself - waking up at the right time, having your pre race meal, and getting out the door with all the stuff you need for the morning. Add a baby to the mix and a plan for what to do with her that morning that quickly went out the window, it makes it complicated. I opted to warm a bottle and pack it along with snacks and wake my daughter about 5 minutes before I wanted to leave home. I made the right call! We arrived and parked at Lonsdale Quay. 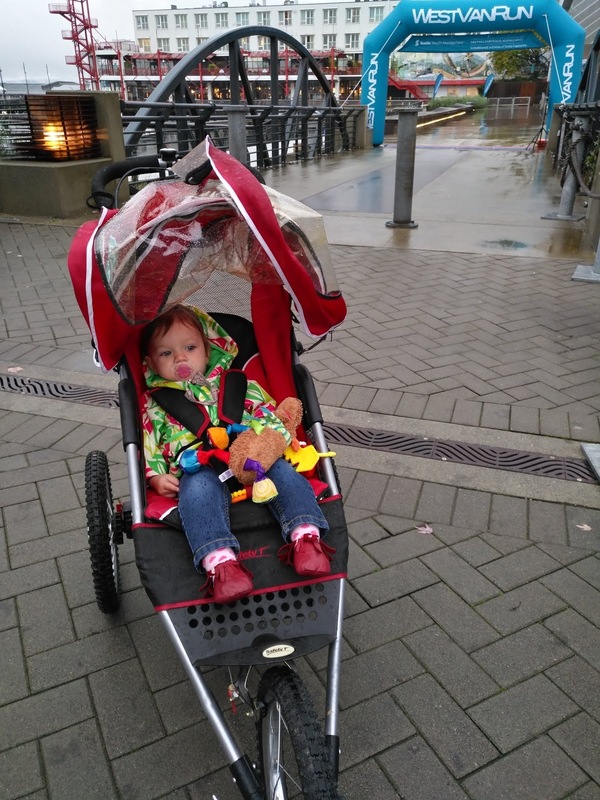 I put the running stroller together and loaded it with our gear for the day - my daughter's food, dry clothes for me, my phone, and the rain cover. I popped her in and wondered when she'd have a meltdown since I woke her up from a deep sleep to bring her outside into the cold and rain, and she hadn't had anything to eat yet. 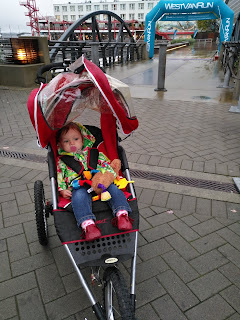 We made our way to the start line area, said hi to some friends, and then found shelter from the rain so I could take the rain cover off the stroller and let her drink her bottle. Super Mom level 6 achieved! Knowing the bottle would be enough for her for likely the next 45 minutes or so, I decided it was OK to not stress about giving her food until after the race was over. We hung out in the Shipyards area to talk to friends and hide under vendor and food tents, and while I was at it, I scoped out the snack situation. Races always provide wonderful snacks at the finish line and I rarely partake as I have a hard time eating immediately after a run. I looked around though so see what there was and what could I potentially share with my daughter. Knowing the finish line was in a different spot and it might be a little while before we come back to this area, I grabbed a banana and stored it in the stroller. Yay for storage during a race - something I never have really ever had to my disposal. But I wasn't thinking of myself - this was part of my next-level super-mom thinking. A couple minutes before race start, we came out from behind the shelter and lined up for the race. We took a spot in the back and it became clear at this stage that I was the only one there with a stroller. My daughter continued to be in good spirits, but after a few minutes of sitting in one place in her rain protection bubble, she started fussing. Oh no! We're just about to get going, and now she gets upset? I had confidence though that once we started moving, she'd be fine, and the experience would be positive. I tried to entertain her with peekaboo and other baby nonsense until the gun went off. This girl of mine, she likes moving, and she loves going fast in the running stroller. She doesn't like sitting in one spot. You'd know this if you saw the way she crawls at full speed all over our home. So off we went, starting very slowly at the back of the pack, to allow space for us to move and turn corners in the beginning of the race where there are lots of turns. It took several minutes and about 1km to get into our groove as there was a lot of weaving and waiting for people who were jogging at a much slower pace and didn't notice us to move out of the way so we could pass. Knowing that this event wasn't about achieving a time, I was mostly relaxed about this. But at the same time, my pace is where I am happy, and move the most comfortably, and it took a while before I could achieve that pace rather than shuffling my feet and walking. Being in tight quarters with a stroller without room to maneuver is challenging and in order to achieve a feeling of safety for my daughter, I wanted to get us more room away from people who might trip over the stroller if they don't notice us passing and dart in a diagonal at the wrong time. It was definitely tough to navigate the crowd, but soon we got to a point where we had space to move and freedom to go our pace. It was awesome! I could hear my daughter giggling and babbling and clearly enjoying herself. I had a blast too. I always love the energy of a good race. The rain didn't bug me even the slightest. There was one bigger hill which I walked up and down because with the stroller that would be too difficult to manage. But aside from that, we kept moving at a decent pace all the way to the finish. We reached the finish line, on the beautiful pier overlooking the Burrard Inlet and downtown Vancouver, in just over 35 minutes. This was great because normally when I do 5km with a stroller, it takes a bit longer than that; the added effort of pushing adds up to 1 minute/km to my pace. The energy of the race definitely always adds pep to the step though, and I know that if that first km wasn't so slow, we could have been even faster. I was almost in disbelief that we crossed so fast. My daughter is indeed my favourite training partner, and maybe there's something to racing with her. At the finish line with my daughter in her rain bubble, me holding my medal awkwardly. We hung out at the finish and socialized with friends a bit. My daughter ate the banana I saved for her, so I knew we'd keep the hunger away a bit longer. Selfie at the finish to show off the medal, baby eating her banana, good friend photobombing! After some socializing at the finish line, we headed back to the Shipyards where the food and vendor tents were and grabbed some snacks, which ended up being my daughter's breakfast which I took only a few bites of. Ha! She loved the scones from Cobs Bread and the Teff bars. Mmmm! It was great to see so many smiling familiar faces, despite the rainy weather. After I knew baby was full from her breakfast, we made our way back to the car to come home so we'd be back for first nap. It was a special first race together, and hopefully the first of many more to come. It was also part of a lovely send-off for myself, leaving North Vancouver which has been my home for so long. In the afternoon, my daughter and I spent time at my aunt's home for lunch and to celebrate her 1st birthday a little early. Then in the evening some of my girlfriends threw a little farewell dinner party for me, and I left baby home with her dad. It was such a very special day which I will remember fondly. What's next for me as a runner? Well, exploring my new home of Victoria, BC for sure. It's a great runnable city and lots of trails near our home to explore. It's also home to many great races which I am excited to run for the first time. Stay tuned to learn about our upcoming adventures.